The latest wearable isn’t a fitness band or an activity tracker or watch. It’s a glove that outfits the wearer with a whole new set of fingerprints. Researchers say the glove will allow developers to test biometric systems—like the fingerprint scanners at airports and border crossings—with more standardization and accuracy. But could criminals also play a hand in the deployment of this technology? Ananya Bhattacharya, an editorial fellow at Quartz, talks about it in this episode of Good Thing/Bad Thing. Ananya Bhattacharya is an Editorial Fellow at Quartz. IRA FLATOW: And now it’s time to play Good Thing, Bad Thing. Because every story has a flipside. Now, you’ve heard of wearables. You might even have one, like an Apple Watch or a Fitbit. 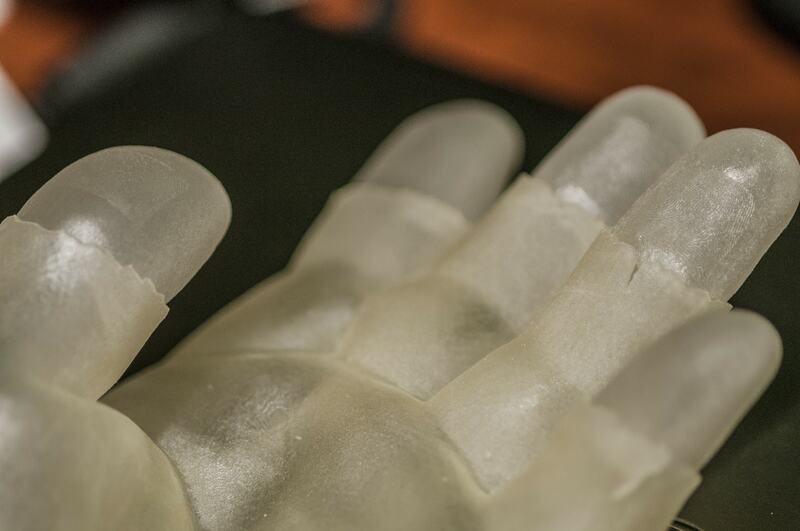 But how about a glove that turns your fingerprints into someone else’s fingerprints? Seems like I’ve seen this in science fiction or detective stories somewhere. Well, researchers say that the new 3D printed innovation will allow us to more accurately test and calibrate fingerprinting systems like they have at the airports, or border control, and so on? Sounds great. But are you like me, already thinking Spy Versus Spy? Here to talk about the good and the bad of this fingerprint glove is Ananya “Bhachatara”– Bhattacharya. Sorry, Ananya. Bhattacharya is an editor fellow at Quartz, a site that covers the new global economy. She joins us here in our New York studios. Welcome to Science Friday. IRA FLATOW: So tell me about the good thing about– what’s the good thing about having this glove? ANANYA BHATTACHARYA: Sure. So the good thing is that you can make this one model that’s going to let you have repeatable, consistent tests that you can use across various fingerprint machines for different vendors at different sites. So it’s all the same. It’s not different people trying out the same machine multiple times because that can sort of throw the calibration off a little bit. And the other thing is that you’re going to have this one hand that possibly is not using actual biometric data. You could have fingerprints, but they wouldn’t match up to someone else. So if its gets stolen or is used, it’s not actually a problem. IRA FLATOW: So have they actually done that, taken– where do they get a fingerprint? How do they get it on a glove? ANANYA BHATTACHARYA: So the way they do it is they put it in the software on the computer. They design the fingerprints. And then they print this glove using 3D print material, which is proprietary. And the ridges actually form really well when you 3D print this. And then when you put it on a scanner, it acts just like skin. And it splays out the way skin would, unlike using 2D scans. IRA FLATOW: Right. Is it possible for me to take my homemade 3D printer and make one of these gloves? Are there people already thinking about that? ANANYA BHATTACHARYA: Yeah. No, it’s not. Because the researchers actually tried this with the MakerBot that comes in at around under $1,000. And it doesn’t work. The printer they use actually cost $250,000. IRA FLATOW: 250 grand? That’s a little above most people budgets. But I’m going to push back on this. Not above someone who wants to do criminal activity, or illegal activity, or espionage, or something like that. ANANYA BHATTACHARYA: That’s true. And that’s why the researchers have actually shared it with other companies and scientists because they’re trying to tell them that, hey look, if someone gets biometric data and they get this machine, they can print out your fingerprints. And what they want people to do, which doesn’t yet exist, is create anti-spoofing technology so it could tell the difference between a human hand and a fake model. And the way it would happen is that you would turn this technology off when you’re calibrating the printer and use the model for consistency. And then you would turn it back on so it could tell when an actual human hand is there and only identify that. IRA FLATOW: So how far have we gotten with this? Where do we go from here with this technology? ANANYA BHATTACHARYA: Yeah, so the researchers themselves haven’t made any progress in terms of creating this anti-spoofing technology. But we definitely know that you can create these. And the other stuff that they’re doing now is to actually 3D print an injection molded case that you can then pour silicone and cheaper materials into to keep creating these hands at a lower cost, rather than continuously 3D printing them. IRA FLATOW: Because you can see– I mean, I can see technology making it easier and easier, right? To make your own copy of this? ANANYA BHATTACHARYA: Right, yeah. So if someone gets their hand in the mold and then they pour in silicon, they could make their copy for much less than 250 grand every time. And that’s why they’re putting this out there to quickly start coming up with countermeasures. IRA FLATOW: So they’re looking for people, the public? I mean, are they announcing this as a– put it out on the internet and see who can come up with some way to block this? ANANYA BHATTACHARYA: They’re sharing it with vendors and scientists right now, not really with the public. And even if the public does know, these particular researchers also have been working on it for months and it took really long for them to even get this far. So somebody who doesn’t have that base would still have trouble getting to this point. IRA FLATOW: Well, It’s kind of a really interesting looking glove. Thank you. Ananya Bhattacharya is an editorial fellow at Quartz. We’re going to take a break. And coming up, we’re going to talk about why the internet of things could be hurting us. Remember that cyber-attack we had a week ago? We even had it affect us on Science Friday. Our chats weren’t working so well. We’re going to talk about how to prevent that. Plus Alan Alda’s here with his new Flame Challenge. We’ll break the mystery of what this year’s challenge is. So stay with us, we’ll be right back after this break.